Dental veneers (sometimes called porcelain veneers or porcelain laminates) are wafer-thin, custom-made shells of tooth-colored materials designed to cover the front surface of teeth to improve your appearance. These shells are bonded to the front of the teeth to change the color, shape, size, or length of the patient’s teeth. Porcelain veneers resist stains and their translucent and polychromatic characteristics mimic the light reflecting properties of natural teeth. Initial Consultation For a smile assessment and discussions around options available. An impression of the tooth is then taken and sent to the laboratory where the crown is manufactured. Dental Crowns can last between five and 15 years, depending on the amount of wear and tear and the level of good oral hygiene. 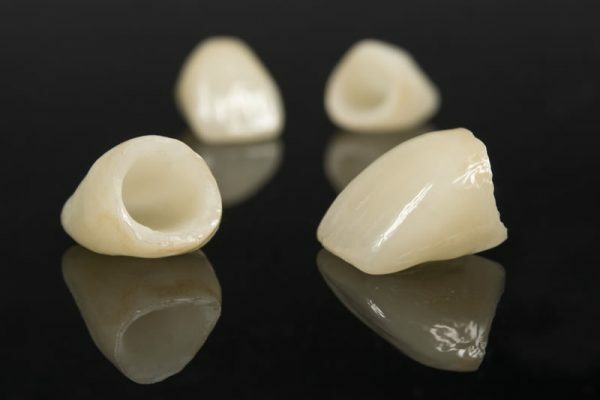 Crowns can be made of porcelain, predominantly used for front teeth to maintain aesthetics or a mixture of precious metal fused with porcelain to increase strength for molar teeth. Initial Consultation For a smile assessment and discussions around options available and procedure. Preparation Preparing tooth to the desired shape, either filing down the tooth to make room for the crown or apply a filling material to build up the tooth to support the crown. An impression of the tooth is then taken and sent to the laboratory where the crown is manufactured. Our dentist will also meticulously select the shade of the crown that most closely matches the colour of the neighbouring teeth. A temporary crown will be fitted while the permanent crown is being made. Our dentist will check the fit and colour of the new crown and if everything is acceptable, a local anaesthetic will be used to numb the tooth and the new crown is permanently cemented in place. 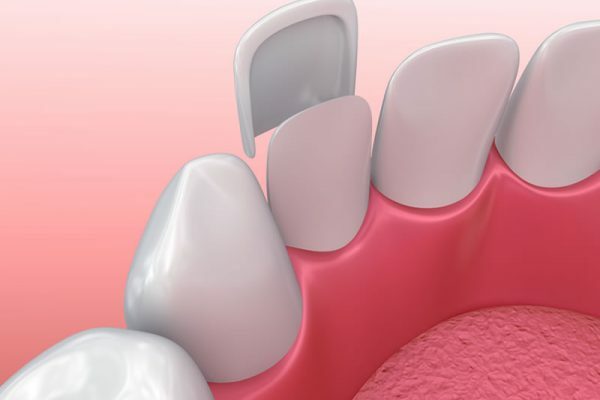 A dental bridge effectively bridges the gap created by one or more missing teeth. To create the bridge, a crown may be placed on either side of the missing tooth, as an anchor, and another crown is placed in the gap. Initial Consultation For an assessment and discussions around options available and procedure. Preparation Preparing the adjacent teeth to the missing tooth. Preparations include reshaping the teeth, either by filing down the tooth to make room for the crown or applying a filling material to build up the tooth to support the crown. Next, an impression of the teeth is made and sent to the laboratory where the bridge is manufactured. Our dentist will also meticulously select the shade of the crown that most closely matches the colour of the neighbouring teeth. 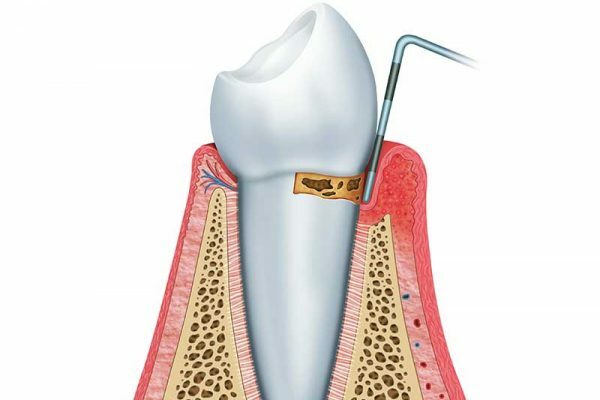 A temporary dental bridge will be fitted to protect the exposed teeth and gums while the bridge is being made. 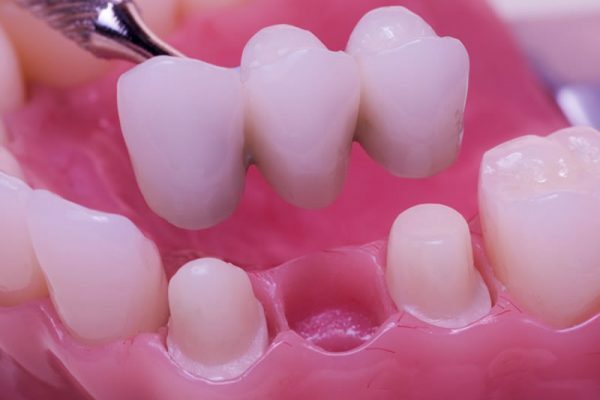 Our dentist will check and adjust the new bridge to achieve a proper fit required depending on individual’s case. Once the bridge is fitting properly, a local anaesthetic will be used to numb the teeth and the new bridge is permanently cemented in place. Fillings no longer need to look ugly with the old amalgam silver fillings. At SmileCo, our dentists take into account the aesthetic of the tooth, durability and affordability and work with you to determine the type of filling best suited for you. Our clinic offers superior porcelain and resin fillings which are both natural looking and only require a single visit procedure. Composite resin fillings are placed in soft and set hard with blue light and are more suitable to smaller cavities. Resin fillings are less expensive than porcelain fillings but are not as durable. Porcelain fillings are hard prefabricated fillings that are bonded into the cavity and are the preferred filling for larger cavities. They are more expensive than the composite resin but are more durable and therefore last longer. Tooth Whitening – Is it for you? Do you want whiter looking teeth? Have you noticed that over time, they have changed colour? There are two reasons why our teeth can appear more ‘yellow’. It can be due to external factors, which can be caused by our diet, smoking or poor oral hygiene, which have resulted in staining our teeth. It can also be due to internal factors within the tooth structures such enamel or dentine defects, having high doses of antibiotics or fluoride as a young child. 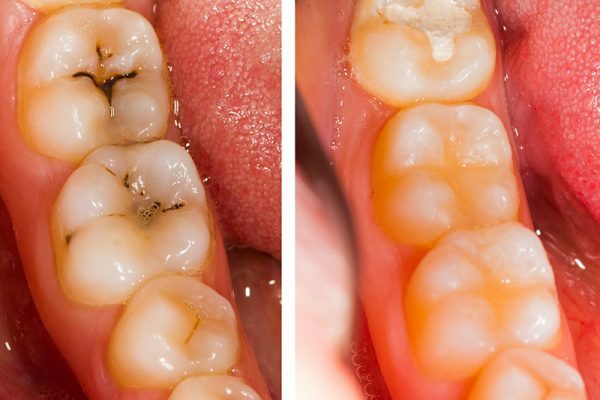 It is normal for your teeth to appear more ‘yellow’ over time. This is because the outermost layer of tooth structure that you can see is the enamel, which is actually translucent. The different shades of colour that we can see in our teeth is due to the underlying tooth structure called dentine, which can become more ‘yellow’ or darker over time. 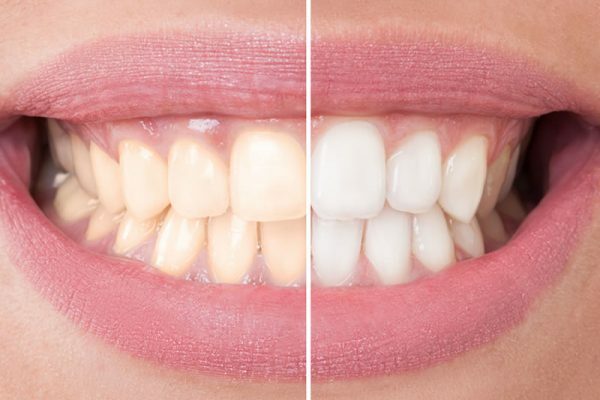 There are a range of tooth whitening products available in the market, but it can be overwhelming on which one you should choose and which one is actually effective. It is important to be aware that some toothpastes which advertise to ‘remove stains’ can in fact do more damage to your tooth. This is because these certain toothpastes, contain abrasive particles in the toothpaste, which can remove staining, but also the enamel surface. Our tooth whitening products contain Hydrogen Peroxide is known to cause the enamel structure to appear whiter. There are a few whitening toothpastes available in the supermarket which contain Hydrogen Peroxide, however at very low percentages which can take a very long time to have any whitening effects. We have two types of tooth whitening products available at our clinic: Home whitening or In-Chair whitening. The at home whitening is takes approximately one to one and a half weeks to take effect as there is a lower concentration of Hydrogen Peroxide. Some patients that have mild existing sensitivity prefer the home whitening as high concentrations of Hydrogen Peroxide can increase sensitivity. The In-Chair whitening takes approximately 2 hours and you should be able to see the results at the end of the appointment. As the tooth whitening for In-Chair whitening occurs more rapidly, there is a higher concentration of Hydrogen Peroxide which can increase the risk of post-whitening tooth sensitivity. It is important to understand that tooth whitening is a cosmetic procedure and we need to ensure that your oral health is optimal before we proceed with the tooth whitening. It is essential for us to ensure that you are the right candidate for tooth whitening as it is not appropriate for every patient. So if you are very interested in having your teeth whiter, please feel free to make a whitening consult with one of our lovely oral health therapist or hygienist at no out of pocket cost. We understand the inconvenience patients face with a traditional crown, and because your time is as valuable as your smile, we now use a revolutionary tool that mills a permanent porcelain crown in only about an hour: CEREC®. What is CEREC®? Chairside Economical Restorations of Esthetic Ceramic or ‘CEREC®’ is a new state-of-the-art method of constructing tooth restorations using computer-assisted design (CAD) and computer-aided manufacturing (CAM) to offer one-day restorations for patients. After taking a 3D image of your tooth, our CEREC® machine can mill a strong, beautiful restoration in about an hour. We’ll permanently place the crown during your single visit, and you’ll leave our office with a full, healthy smile. When your gums recede, your body loses one of its best defences against sensitivity and decay. Besides giving the appearance of being “long in the tooth”, gum recession puts you at a much higher risk of cavities and pain. Often this is caused by gum disease, aggressive brushing, smoking, tongue/lip piercings, and, sometimes, even teeth grinding. Previously the treatments for this have either involved relying on anti-sensitivity toothpaste or placing unattractive fillings over the roots. Neither of these techniques actually solve the problem, they only cover it up. Now at SmileCo, we can offer a different way to correct receded gums: a gingival graft. Using a minimally-invasive technique, the gums can be lowered back down to their original height, covering up the sensitive root surfaces and restoring the aesthetics of your smile. Botox® is an injectable medication that is used as a muscle relaxant. As such, our dentists are able to utilise this reliable medication in the treatment of any health or aesthetic problem a patient may be experiencing across the facial region. Traditionally, lines appearing on the forehead; between the eyes (glabellar region); and around the eyes (crow’s feet), have been the most common areas treated for aesthetic reasons, however the number of new uses for this remarkable substance has expanded substantially and now includes other areas of direct importance to dentists. The treatment of Temporomandibular disorders (TMD), tooth grinding (Bruxism), “gummy smiles” and many other conditions caused by undesired muscle action, can now be made simpler and less invasive through the use of Botox® injections by dentists. One of the most common uses is in the treatment of dynamic lines or wrinkles on the face, which are those caused by the action of the muscles of facial expression. These lines can cause skin deterioration and aesthetic defects which appear to artificially age a person and have a significant impact on self-esteem. Botox® injections relax the action of the underlying muscles and minimise the resulting lines on the skin. Owing to the superior knowledge of facial anatomy; daily practical experience dealing with the functional and aesthetic aspects of the muscles of the face; and an ability to provide accurate and comfortable injections; dentists are the most qualified people to be providing facial injections after attending Botox® training courses with Australasian Academy of Dento-Facial Aesthetics. There’s more to your smile than just teeth. SmileCo dentists have been trained and certified by the Australian Academy of Dento-Facial Aesthetics and are in a prime position to offer patients the complete beautiful smile that is beyond the teeth. Have you noticed that your lips, chin, cheeks or nose are starting to sag? Dermal fillers could be the non-invasive procedure you are looking for to restore this plumpness to your face. Dermal fillers are administered via tiny injections and the results are almost instantly visible! As we age, the skin loses elasticity, volume and structural support which leads to a deterioration in skin health and function, together with the formation of aesthetic defects such as deep lines, grooves, and folds – especially around the mouth. In addition to this, our lips, which are one of the most prominent features of our face, begin to lose volume and become thinner and less well defined. Naso-labial and Marionette lines are formed by skin folds running between the nose, mouth, and chin. These furrows are among the first to appear on the aging face, and together with lip enhancement, are the primary areas treated by Dermal Fillers to improve facial rejuvenation. Dermal Fillers are a temporary treatment method that provides immediate structural support and improved skin conditioning leading to the reduction of facial lines and improved skin health. 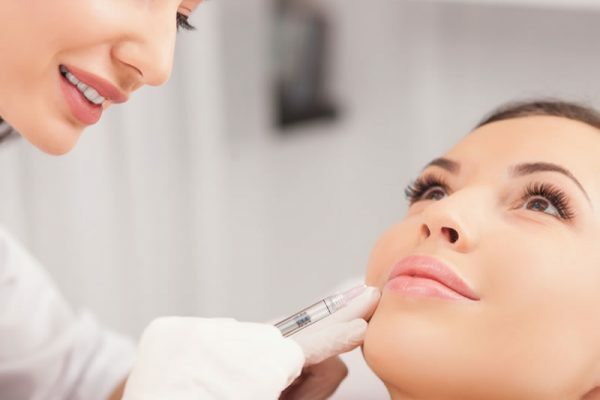 Dermal Fillers consist of a substance that naturally occurs in our bodies and is therefore broken down by natural means and is hypo-allergenic.